You enter another room, filled with books. A male duck with white feathers and a golden hockey mask, approaches you. "Hello there! I suppose you've come here to find out how we ducks came to this planet? My name is Wildwing, I am the leader of the Mighty Ducks. Here is our story of how the team originated." He hands you a small book. "This oughtta help you have a better understanding of who we are." The Mighty Ducks are a team of 6 hockey playing, alien ducks from another planet, in an alternate dimension. Their planet is known as Puckworld, named so, after their legendary hockey player and team captain, Drake Ducaine. ......Until just a few years ago, the last surviving Saurians and their overlord, Dragaunus, escaped from dimensional limbo and attacked and invaded Puckworld once again. That's when the Mighty Ducks and the legendary mask came into play. Just when the Puckworlders thought there was no hope, one of the last surviving members of the Resistance, Canard Thunderbeak, found the mask of Drake Ducaine. He then assembled a team of ducks to help him fight against Dragaunus. The team included the leader, Canard (of course), his best friend, Wildwing Flashblade and Wildwing's younger brother, Nosedive, Mallory McMallard, a weapons specialist, Duke L'Orange, a notorious jewel thief (who turned to good when the Saurians attacked), Tanya Vanderflock, a computer and technical wiz, and Grin, the strongest and biggest guy on the team. 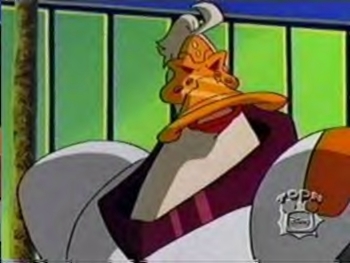 With the help of the mask, the ducks were able to locate Dragaunus's master tower, destroy it, and kick him off of Puckworld. However, they followed him, hoping to take him out completely. They followed Dragaunus right into a dimensional gateway. Within the gateway, Dragaunus released an electromagnetic worm to destablize it and to destroy the ducks. Canard, being the team leader, decided to sacrifice himself to the worm, to save the team. But, before he did, he gave the mask to Wildwing, making him the new team captain. The six remaining ducks followed Dragaunus to the other side of the gateway, which lead them to Anaheim, CA, USA, planet Earth. After landing on Earth, the ducks decided they needed to play hockey "to keep their edge". That's when they met Phil Palmfeather, their manager. When he noticed how well they played, he got them a contract, making them an official team. With the profits from their games, the Ducks built their headquarters underneath the Anaheim Pond, where they now reside. So, now they live here on Earth, constantly battling with Dragaunus, his three henchmen, and his hunter drones, until the day they defeat them. They also fight crime out on the streets if they see anyone in trouble. If the Ducks aren't playing hockey, fighting crime, or battling the Saurians, they're doing endorsements, promotional events, or having spats with Klegghorn, the Captain of the Anaheim Police Department.